Blokus, the bestselling board game, comes to the computer for the first time! 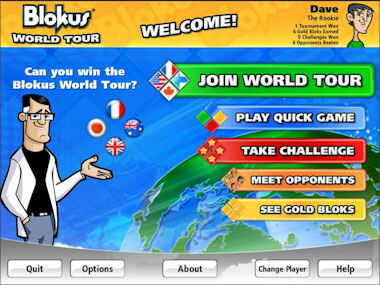 In Blokus World Tour, you get to travel the globe in your quest to become the Blokus world champion. This top quality game features 10 unique tournaments to win, 16 competitive computer players to beat, 8 mind bending challenges to conquer and 21 shiny gold Bloks to collect. 16 Computer Players To Beat! 21 Gold Bloks To Collect!